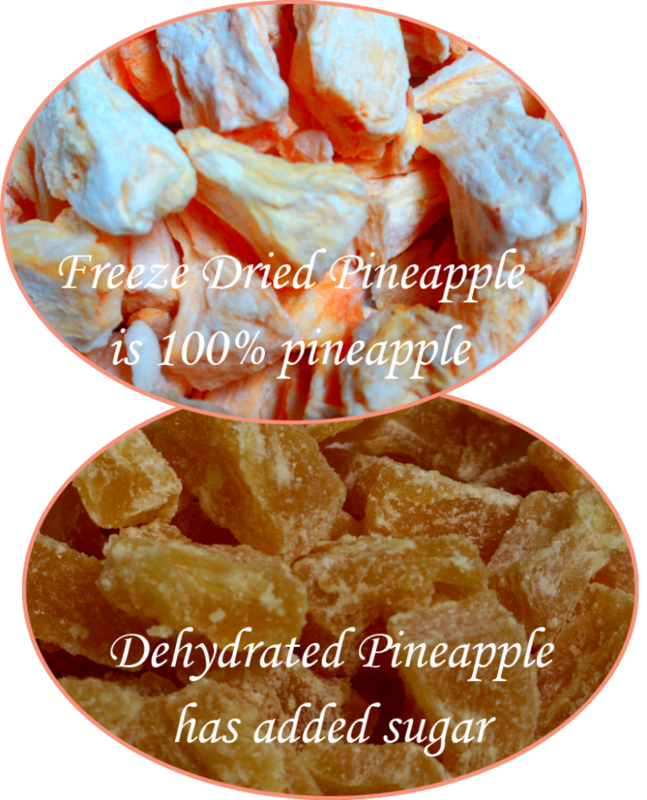 What is the difference between freeze-dried and dehydrated foods? storage" were solved when I discovered freeze dried foods. Suddenly "food storage" was healthy, tasted good and could be easily rotated in my everyday recipes! I was excited. I've learned a lot about dehydrated and freeze dried foods since early 2008 and I occasionally hold cooking classes to teach others what I've learned. During each and every cooking class I hold there are numerous people who use the words freeze-dried and dehydrated interchangeably. Based on that, I'm guessing there are a few of you....maybe lots of you....who are just like I was: surprised to find out there is a difference between freeze-dried and dehydrated foods and curious about what the difference is. The difference is actually pretty big! And it is very important to understand the difference when building a home store for your family. Over the last few years, I have consulted with many people who have had to throw away thousands of dollars in unusable food because they invested in the wrong thing in the first place. Don't let that be you! The product is frozen, then placed under vacuum which allows the water in the product to vaporize without passing through the liquid state. About 98% of the water is removed. The product is heated and water is removed through evaporation. It is impossible to remove all the water. Depending on the process about 5%-30% of the water remains. Since there is no water left in the product, no additives at all are needed in single ingredient cans. For example, a can of peaches will have nothing but peaches in the can. When you start combining ingredients (as in freeze-dried just add water meals), additives and preservatives are needed. Retains all nutrients. 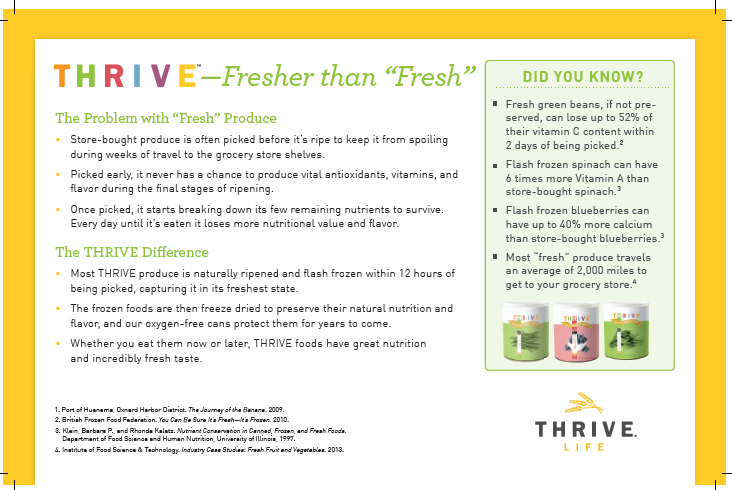 Thrive freeze dried product is naturally ripened and then flash frozen within hours so it can actually contain even more nutrients than artificially ripened produce found at the grocery store. When hydrated, the color, taste, and texture are all very similar to the original product. Without hydration, the product is dry and can easily be crushed to a powder. Difficult to re-hydrate (try turning a raisin into a grape or Beef Jerky into Roast Beef). For products that can be re-hydrated, it must be done with hot water and requires far more water than a freeze-dried product. Since the water must be hot, re-hydration requires fuel (which would be precious in a true emergency situation). Some products can be used in cooking or baking, but because of the change in texture caused by dehydration, not with as much ease or the same quality results as with freeze-dried products. freeze-driedd including Fruits, Vegetables, Meat, Cheese, Yogurt, even Ice cream! Hydrated in place of a fresh product in any recipe. Fruits and some veggies and even cheese are also fantastic as snacks. A picture really does say a thousand words. 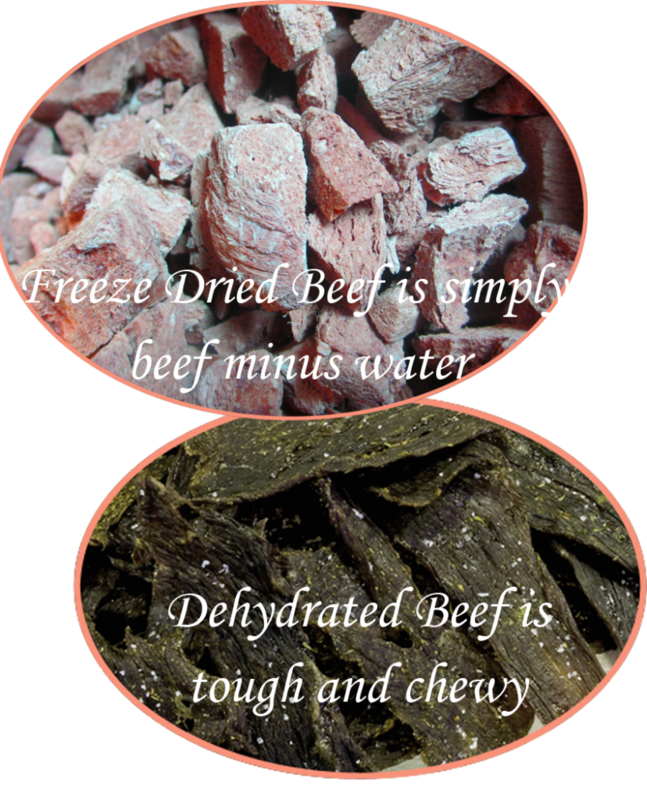 Here are a few pictures that say far more than I ever could about the difference between dehydrated and freeze dried foods. Especially note the differences in color and texture! I know some people also consider canned foods for their food storage. Well, canned is to dehydrated like dehydrated is to freeze dried. Canned foods have lots of heat applied, few nutrients, lots of additives, and a very short shelf life (usually 1-3 years). Personally, I avoid them whenever possible. 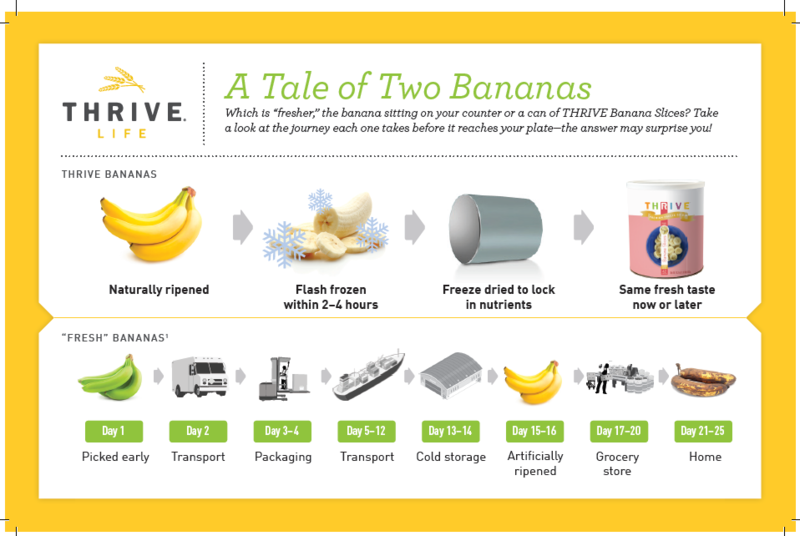 My favorite place to purchase freeze-dried produce is Thrive Life as their food has the most color and flavor, but you can also find freeze-dried food at Emergency Essentials and Augason Farms and Honeyville. So there you have it! 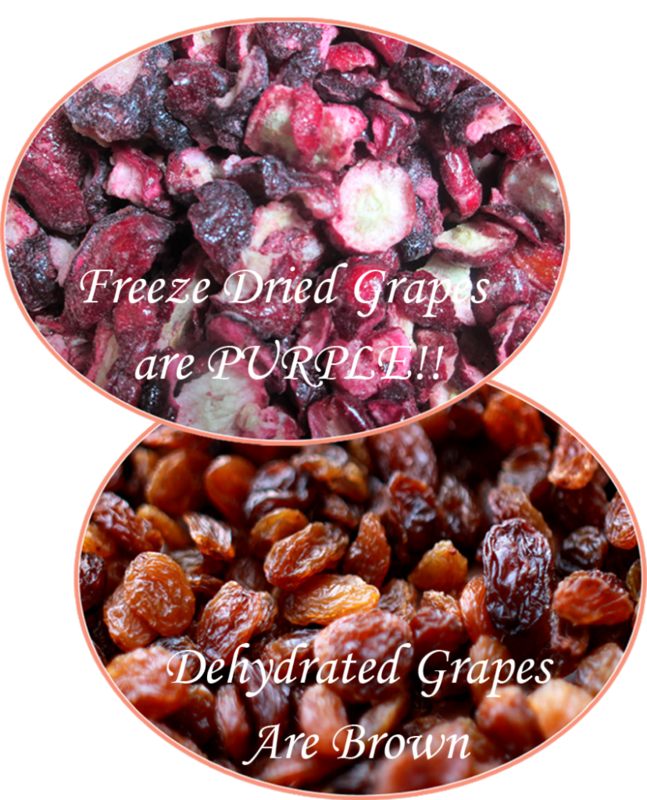 The difference between freeze-dried, dehydrated, canned and “fresh” produce! I’d love to hear your experience or answer any questions you have. Just leave me a comment below! I have a question…are you saying when I put together a meal using all freeze dried foods ie: taco soup that It has to have additives and preservatives then? 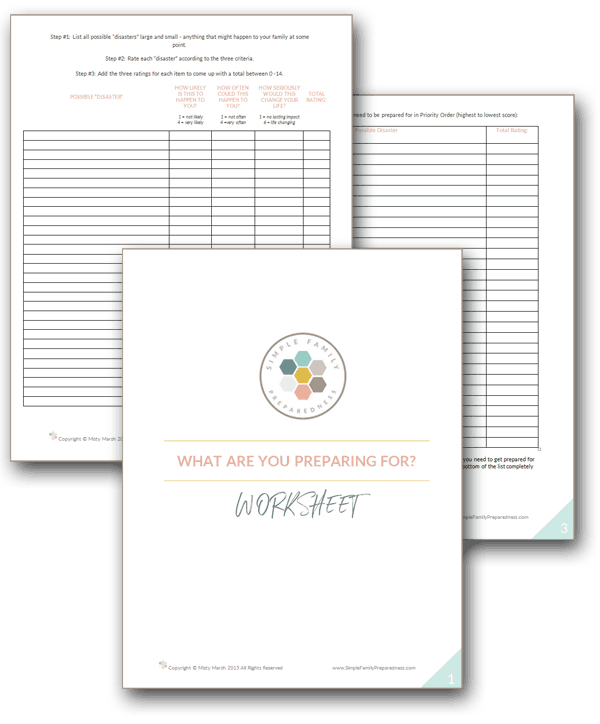 What about freeze drying your own instead of buying freeze dried?